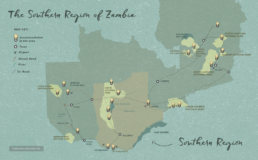 Why should you visit the Southern Region of Zambia? 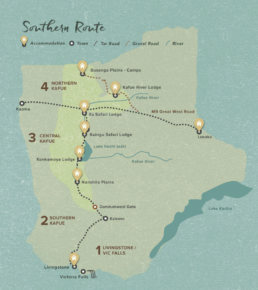 On one hand, it is home to the famous and deservedly sought after Victoria Falls witnessed from the town of Livingstone and yet, just a 3 hour drive from Livingstone, you enter Zambia’s largest National Park – Kafue – which is the size of Wales and is HARDLY EVER EXPLORED, especially from the Southern section. The Southern Kafue has experienced a TREMENDOUS RE-BIRTH from a game viewing point of view and now offers some of the best game viewing in the whole of the Kafue with SUPERB DIVERSITY complimenting its legendary birding.